Sue Dyson and Roger McShane. First published in Wine Talk, October 2017. Without the right soil, grapes don’t develop deep flavour. But what is the right soil? Good soil is not necessarily rich soil. It can be quite sparse soil provided is supports a healthy level of bacteria and fungi. 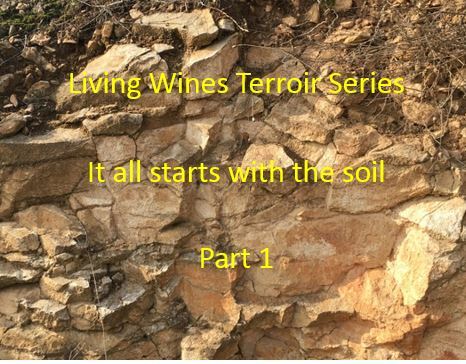 In the next three newsletters we will examine the influence of soils, their mineral composition and the inhabitants of the soil (worms, spiders, bacteria and fungi) have on the quality of grapes and hence the quality of wines made from them. We will also examine how elements from the soil are transferred into the vines and then into the grapes whether from the atmosphere or from the soil. Why the concentration on the soil? We have written before about the fact that most of the vital nutrients required by grapevines and grapes are sourced from the soil not the air. Only three of the essential 16 elements required by grapevines are absorbed through the leaves of the vine (carbon, oxygen and hydrogen). All the rest must come from the soil. As an example, one of the most vital elements required by plants to create plant tissue and to create the vital chlorophyll is nitrogen – which must be absorbed from the soil. The same applies to magnesium. Remember that chlorophyll is the next most important molecule to water in supporting life on this planet. The chemical formula for chlorophyll is C55H72O5N4Mg as can be seen in the diagram immediately below. The first three atoms shown in red (carbon, hydrogen and oxygen) can be absorbed through the leaves of plants from the atmosphere, however the nitrogen (N) and magnesium (Mg) shown in blue must be absorbed from the soil to allow the manufacture of chlorophyll by the plant interacting with light from the sun. The nitrogen and the one magnesium atom form a central core for the molecule. So, we have established that plants cannot create their most vital building blocks without soil that is rich in nutrients (but not too rich as we will discover later). Therefore we will turn to the soil to see why it is so important in the production of wine. First we will explore where the soil comes from. Soil mainly comes from rocks. There are three types of rocks – igneous, sedimentary and metamorphic. Igneous rocks are formed from magma (molten rocks) that is present at various levels within the earth’s crust. Granite is created from magma (molten rock) deep within the earth’s crust. The molten magma cools very slowly and therefore large crystals form, including very large feldspar crystals. Upheavals in the earth’s crust can push the granite higher in the crust and it can then be exposed on the surface through weathering, earthquakes and other mechanical activities. Granite is found throughout the Beaujolais area of France where Gamay is the main grape variety. Gamay has a particular affinity for granite and the best wines are made in areas where the granite is exposed such as the Côte du Py in Morgon and the Grille Midi “climat” in Fleurie. Dolerite is another form of igneous rock that results from the solidification of magma just below the surface of the earth. The resultant rocks have a finer grain than granite because the magma cools faster than it does deep in the earth’s crust. Dolerite is very common in Tasmania where it dominates the landscape in the centre of the island, however it is not common in France and we don’t know of any vineyard that has soil created from dolerite rocks. Basalt is the finest-grained igneous rock and it forms when lava spills out onto the surface from volcanoes or lesions in the earth’s crust. As a result, it cools almost instantly and hence the crystals do not get a chance to grow. The result is a dense, dark rock that weathers very slowly. The best example of basaltic rocks in a wine region in France is the majestic Auvergne region around the city of Clermont-Ferrand where Chardonnay, Pinot Noir and Gamay are the favoured grape varieties. The next rock type is sedimentary rocks, which, as the name suggests, is formed from sediments such as sand, silt or calcium rich creatures such as shrimps, krill or ancient trilobites. The rocks are created through compaction and through the solidification of carbonates or silicates that bind the sediments together. There are many different types of sedimentary rocks including siltstone, sandstone, shale, limestone, tuffeau, coal, dolostone, breccia, conglomerate, chert, flint and marl to name but a few. Sedimentary rocks are often classified by the manner in which they formed. Geologists talk about “clastic” sedimentary rocks which are formed through mechanical weathering of other rocks. Examples of clastic rocks are conglomerate, siltstone, shale and sandstone. The second type are those that are formed from organic matter such as coal and some limestones. The third type are those bound through chemical action such as some limestones, flint and chert. We will talk about only two sedimentary rocks due to their importance in producing fine wines. It has long been recognised that soils created from the breakdown of limestone are key for the production of fine wines. Many vineyards in Alsace grow in soils created from Kimmeridgian limestone. These outcrops sweep across to the southern part of the Champagne region (the Côte des Bar) and down into Chablis and Burgundy and then across to Sancerre in the Loire Valley. Each of these areas is renowned for the quality of wines produced there. Kimmeridgian limestone formed almost 200 million years ago during the Upper Jurassic period. There is also fine wine produced along the Loire, but as we move towards the city of Tours from Sancerre the Kimmeridgian limestone gives was to the famous tuffeau which is a much softer limestone. The soil created from tuffeau gives the famous Chenin Blanc wines of Vouvray their characteristic flavour. The other area where there is a very strong link between rock type and quality wine is in the Jura where there is a profusion of marl of various colours including red, white and blue. Marl is a cross between siltstone and limestone as can be seen from the following diagram. 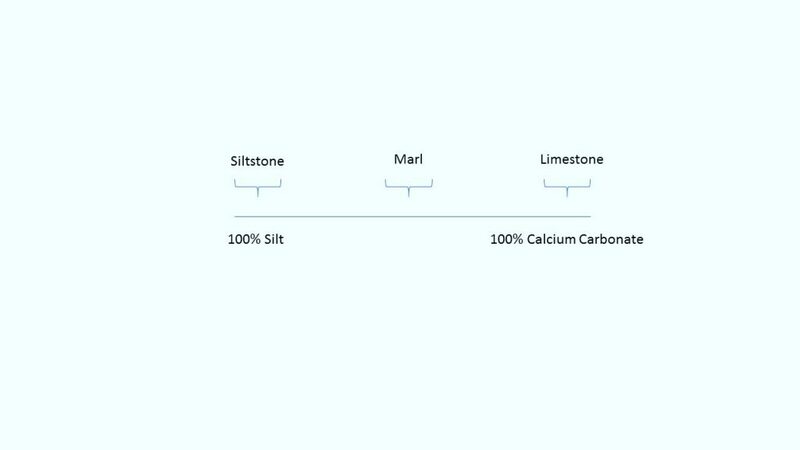 Marl is siltstone that has been bound together chemically by calcium carbonate therefore soils produced from marl have a high calcium content. The third rock type is metamorphic. These rocks have been formed through the action of heat or pressure on existing rock formations. The action of the heat or the pressure does not melt the rocks but can change the chemical composition. Slate is shale that has been heated to change the chemical composition. Similarly, marble is limestone that has been heated. Other metamorphic rocks are gneiss and schist. The “metamorphosis” of these rocks produces minerals not found in the original rocks. In these rocks we see mica, biotite, graphite, muscovite and hornblende among others. When we visit Thierry Michon in the Fiefs Vendéens appellation on the Atlantic Coast we see vineyard with jagged outcrops of schist everywhere. This helps to explain the minerality that is so typical of his wines. We also come across schist in the Languedoc in southern France and in the northern Rhone. In the next newsletter we will discuss how soil is created from rocks through a variety of actions including physical weathering, chemical weathering and the action of biological agents such as bacteria.